Guess what comes out tomorrow? 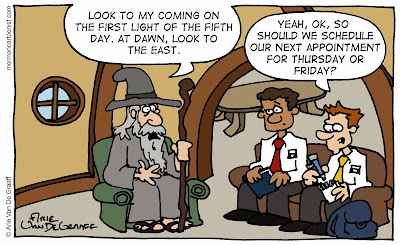 Yep, The Hobbit 2: Peter Jackson's Quest for a Mountain Full of Money. * The only problem with all these awesome, geek-friendly movies these days is that I'm struggling to keep up with them. For example, I only got out to 62.5 percent of the movies I was excited to see this summer--that's barely a passing grade! *This may not be the actual title--I was too lazy to look it up to be sure. This is definitely on the far side of the nerdy continuum. Excellent work! I'm hoping that Pacific Rim and The Lone Ranger are two that you missed. Sadly Pacific Rim was one of the five films I saw this summer. Much like Cowboys and Aliens a couple of years ago, I was suckered into watching a dumb movie by an even dumber premise.